It's been a month since I posted for Corners of my Home for some reason, and it feels good to do it again. Today is a combination Thrifting Report and Corners of my Home. 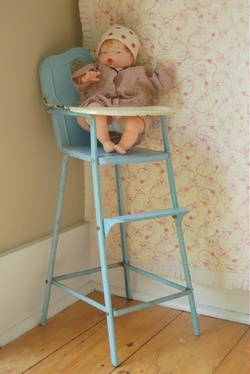 I scored this vintage metal high chair (or 'doll-e hi-chair' as the adorable decal says) at a yard sale this weekend for a mere One Dollar. I love it so very much. At the same yard sale, I found the vintage baby quilt hanging in the background. Yellow with pink dogs and balls of yarn, for crying out loud! Um, that would be 50 cents. Rock on. 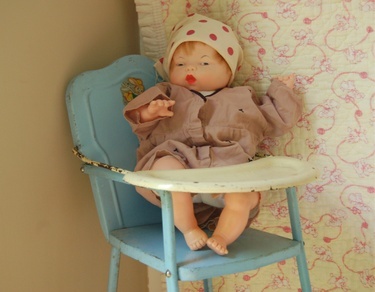 The sweet baby doll was my mom's when she was little, and she winds up in the back and sings. Doesn't she look a little sassy? A little 'too cool for school' or something? I love her and her attitude, and the dress she's wearing (also my mom's). Her kerchief (hiding a mess of hair) is from a scrap of polka dotted silk I found this weekend while hunting with Lisa. We were at an adorable retirement home rummage sale, and thanks to her keen thrifting eye, we moved passed the room of baked goods and found a room full of all sorts of fun things (I hope she shares her great find from there too!). More Corners of my Home on Flickr.